By the late 1920s Bricktop’s Cabaret was the main attraction in Montmartre for a chic international set of celebrities, writers and Royals. Goudie was spotted playing with Freddy Johnson at Bricktop’s. Besides Johnson, house pianists included Garland Wilson and Herman Chittison. Bricktop (Ada Smith) was a mixed race bisexual American cabaret operator and singer with a face full of freckles and shocking red hair. Her famed club attracted songwriters Cole Porter and Noel Coward, writers F. Scott Fitzgerald and Ernest Hemingway. An informally organized yet cohesive community of a few hundred African-American entertainers welcomed and sustained men like “Big Boy” in France. And if his music income ever ran thin the resourceful Goudie had handy skills like his upholstery trade to fall back on. Throughout his life the man had a knack for engaging in multiple simultaneous ventures. Debuting under his own name on disc Goudie gave a remarkable display of instrumental prowess playing trumpet, saxophone and clarinet in succession. The rhythm section backing him featured Django on guitar and Stephane Grappelli – the latter playing piano, which he did very well. 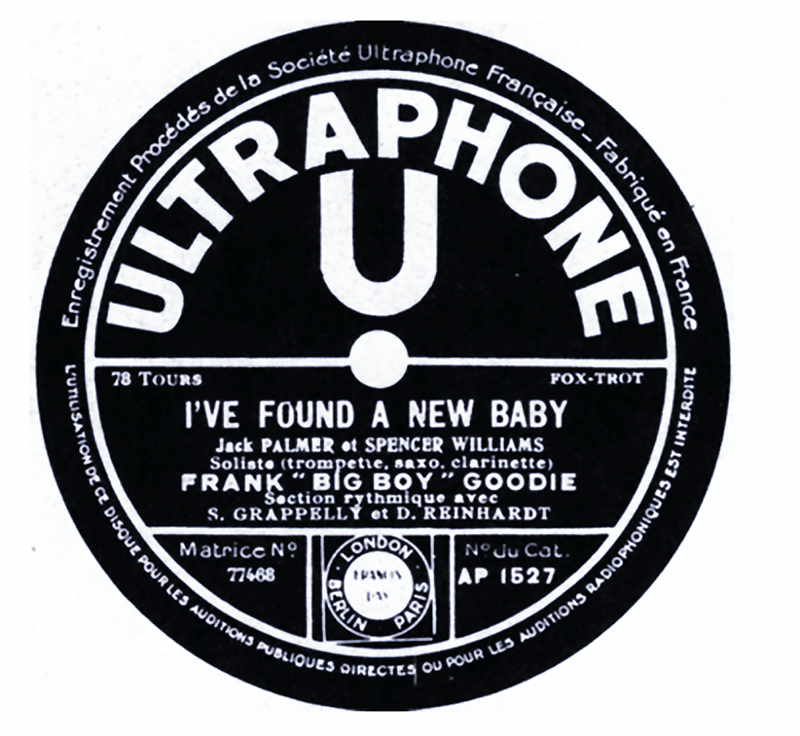 “By the time Goudie made his first records on trumpet in 1935, he would have had approximately 20 years of experience playing the horn, and what is apparent on these recordings is an assuredness and ability to get around the instrument easily. His playing of the lead especially illustrates the New Orleans concept of adhering closely to the melody for the first chorus – a quality that stuck with him for the rest of his life. His first session . . . could in some respects be considered a demonstration of his talents as a musician, as he switches between trumpet, tenor sax and clarinet. This is quite a feat, as each instrument utilizes a different embouchure and uses different facial muscles. Yet he pulls it off with seemingly great ease. 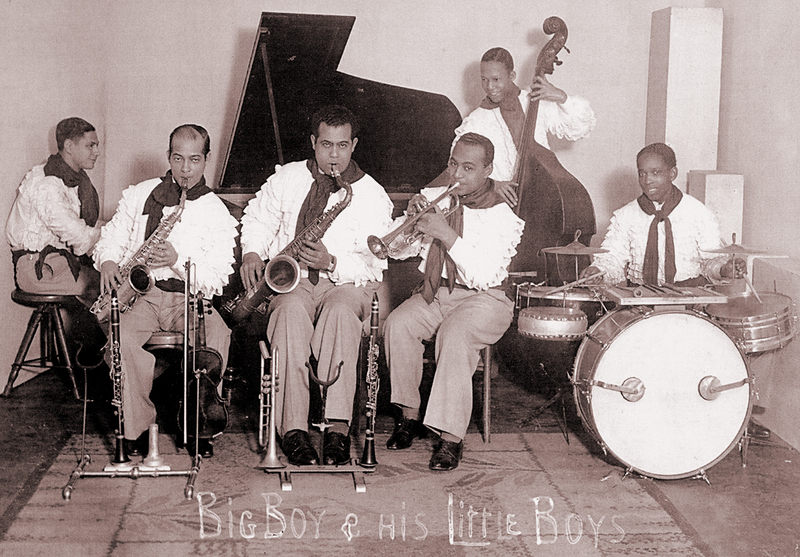 In a staged photo Big Boy is flanked by his Little Boys — Peter Wanderley and Bobby Jones. Note Goudie’s instrument stand with trumpet and clarinet, Wanderly’s with clarinet and violin. From BIG BOY, courtesy of Jean-Pierre Neunier. Goudie ran his own band on the side for almost four years. Documented for the first time in the recent biography BIG BOY, he organized and maintained this sextet while working for bandleader Willie Lewis. A versatile group, it utilized a wide range of instrumentation, arrangements, repertoire and styles — including Brazilian music. They played for dancers at Le Coliseum in 1936 and a variety of Parisian venues. 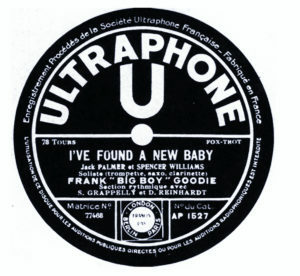 Frank and a couple of his band mates – Brazilian multi-instrumentalist Peter Wanderley and American trumpeter Bobby Jones — were briefly recruited into the orchestra of Martinique-born clarinetist, bassist and drummer Sam Castandet. They played for two months at the Hotel Normandie’s Sing, Sing nightclub on the Channel coast. Goudie was a well-established performer in the early 1930s. 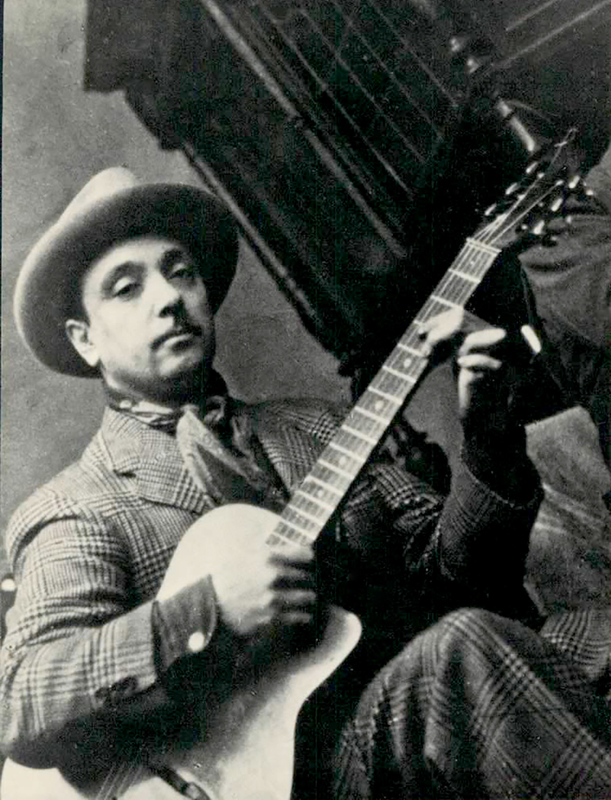 He was headliner for a half dozen concerts that first introduced the gypsy guitarist to Parisian audiences. Django Reinhardt (b. 1910 Belgium – d. 1953 France) was a one-of-a-kind talent and creative force majeur. The illiterate, unschooled Manouche gypsy created the first original jazz style outside of America. That movement is stronger than ever today under the worldwide banner of Gypsy Jazz. “Django had everything. Feeling, soul, technique. He could be sentimental or brutal. He loved big bands, especially Ellington’s, but he liked the freedom of playing the Quintet of the Hot Club of France. He was a natural genius, one of the few who could succeed without training. Sidney Bechet was like that, too. 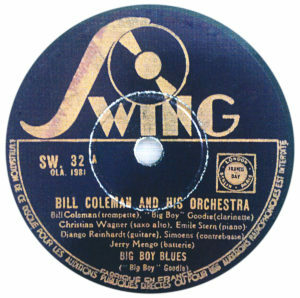 The Bill Coleman recording group waxed “Big Boy Blues” with Django and Goudie.